The library includes both playable melodic pitched instruments and multisampled one-shot percussion and effects. A collection of epic percussion loops which sync to tempo and are playable both whole and by the slice, are also included. Q's interface provides one-click effecting of the library, including the famed EZRoom convolution, delay, chorus, filters, chorusing, flanging, and more. Other advanced functions include a special legato mode for melodic instruments, and crossfade controls for multilayered instruments. 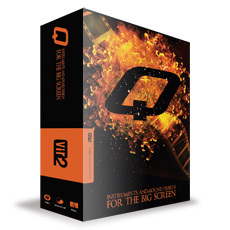 While everything in Q is mapped in Kontakt format ready to play from a MIDI controller, as a bonus many of Q's one-shot effects (such as booms, whooshes, metal scrapes and hits, and special sound effects) are also available on the disc in open 24-bit WAV format. Check out www.vir2.com/instruments/q for more details. AcousticsampleS Libraries as ASPlayer Plug-ins AcousticsampleS has announced that its AkousKontr, Bassysm-F, Bassysm-S, Bassysm-J, Bassysm-M and Bassysm-Pack, Kontr, ElektroKontr, DrumysM and DrumTasteJazz sample libraries are now available in VST and AU instrument plug-in formats via the ASPlayer plug-in.